In the last two decades, the Museum has hosted several restitution ceremonies to commemorate the return of Nazi-stolen paintings and other artifacts to their rightful owners. In 1999, The Seamstress, painted by famed German artist Lesser Ury in 1883, was subjected to a forced sale by the Nazis in 1940, but was returned to the Lowenthal Family in 1999. The Loewenthals immediately loaned the painting to the Museum of Jewish Heritage to ensure that the public was able to see it and enjoy it. In February 2001, the Museum hosted the news conference in which Olevano, painted by Alexander Kanoldt in 1927, was returned to the heirs of Holocaust victim Dr. Ismar Littmann. 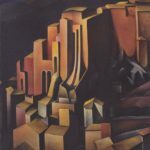 The painting was displayed at the Museum through April 2001. In April of 2009, the 17th-century Dutch painting Portrait of a Musician Playing a Bagpipe by an unknown Dutch artist was returned to collector Max Stern’s estate. In November of 2009, a rare 16th century Viennese bible was returned to representatives of the Jewish community of Vienna. In October 2013, following a historic restitution settlement regarding the Stadt am Blauen Fluss -Krumau (Town on the Blue River – Krumau), a 1910 watercolor painting by artist Egon Schiele, the family thanked Robert M. Morgenthau for his role in retrieving this rare painting at a restitution settlement press Conference held at the Museum before the painting was offered for auction at Christie’s as part of the Impressionism & Modern Art Evening sale on November 5, 2014. The Museum was chosen by the Grünbaum family to host the conference as a setting that would provide a place for reconciliation and healing, yet appropriately memorialize Franz Friedrich (Fritz) and Elisabeth Grünbaum in the context of the suffering of so many in the Holocaust and the resilience and resolve of those who resisted, escaped or survived. In February 2017, the FBI New York Field Office presented representatives of the Max and Iris Stern Foundation, to include beneficiary Concordia University, the painting Young Man As Bacchus by Jan Franse Verzijl (1599-1647) in a ceremony at the Museum of Jewish Heritage. 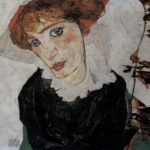 The painting was part of the collection of the Galerie Stern in Dusseldorf, Germany that was forced by the Nazi regime to liquidate its inventory because of the owner’s Jewish heritage in 1936. It was recovered at an art fair in New York City in May 2015, where the FBI served legal papers. During World War II, the Nazis created a division known as the Einsatzstab Reichsleiter Rosenberg (the “ERR”) in order to “study” Jewish life and culture as part of the Nazis’ propagandist mission against the Jews. Principally, the ERR confiscated artworks and other cultural holdings of the enemies of the Reich on a massive scale, and meticulously registered and identified those artworks – even photographing them – thereby leaving behind a detailed record of the works that they stole. In December 1941, during the Nazi occupation of Paris, the ERR seized the Renoir, along with numerous other works, from a bank vault where Alfred Weinberger had stored his collection when he fled Paris at the outset of the war. 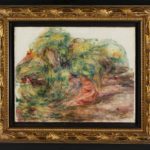 In the decades that followed, Mr. Weinberger sought to recover his property, registering his claim to the Renoir with the French restitution authorities in 1947 and the German restitution authorities in 1958. The Renoir resurfaced after the war at an art sale in Johannesburg, South Africa, in 1975. It subsequently found its way to London, where it was sold again in 1977, and then appeared at a sale in Zurich, Switzerland, in 1999. Ultimately, the Renoir found its way to Christie’s Gallery in New York, where it was put up for auction by a private collector in 2013. It was then that Ms. Sulitzer learned of the pending sale and made a claim to the work as part of her grandfather’s collection. Christie’s alerted the FBI, and ultimately the purported owner of the work voluntarily agreed to relinquish its claim. The U.S. Attorney’s Office and the FBI returned the painting to Ms. Sulitzer on September 12, 2018. Ms. Sulitzer loaned the Museum the painting for a short period of display.